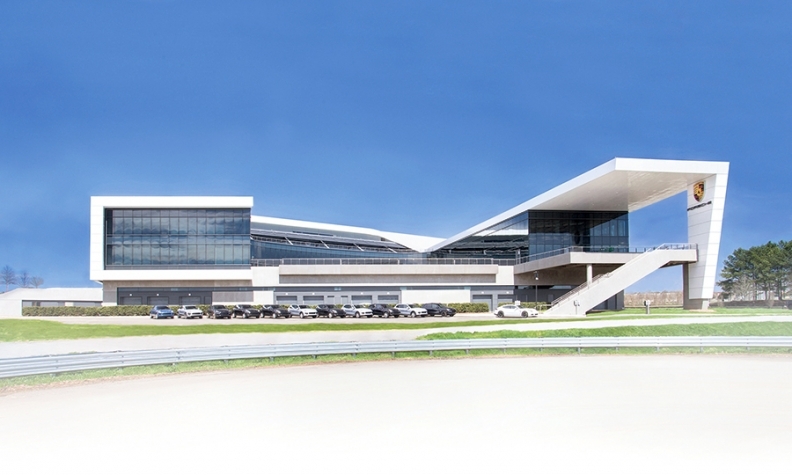 Porsche's U.S. headquarters and experience center complex in Atlanta includes a 1.6-mile test track, below, with six driving modules, including a handling circuit and a low-friction circle. 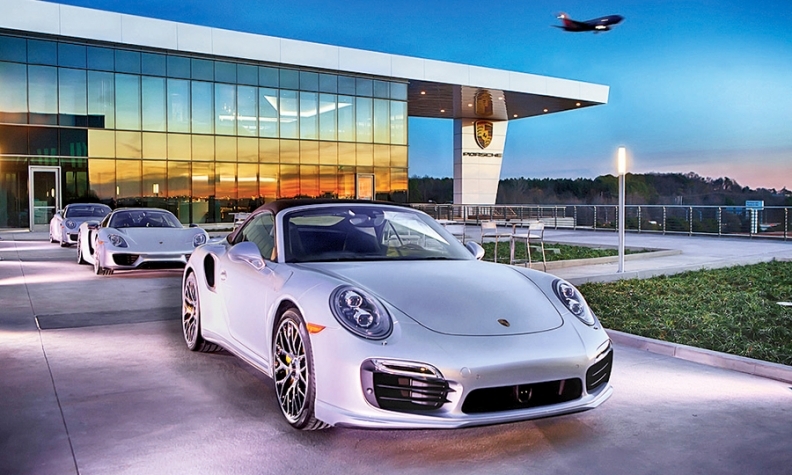 ATLANTA -- Porsche dealers who want to book driving time for their customers at Porsche's new $100 million U.S. headquarters and customer experience center here will get a special deal, the brand's U.S. chief said. But they still will have to pay for the time. Porsche will tell its dealers more about how booking the center's test track will work when the dealers are scheduled to visit the site during the last two weeks of May, said Detlev von Platen, CEO of Porsche Cars North America. He declined to give details before the meeting but said a portion of the center's capacity will be reserved for dealers. If that's not enough, the company can lengthen track hours or eventually extend the track to expand capacity, he said. The Atlanta complex, which had its grand opening last week, plus a second customer experience center opening next year near Los Angeles, will enable the brand's 189 dealerships to more easily and economically provide track time and training to loyal customers, von Platen said. The centers also will set Porsche and its dealers apart from the competition, he said. "They're not selling more products only," von Platen said. "They're selling an experience." Customers will continue to order vehicles through dealers, he said. Public test drives at the Atlanta center will begin in June. Von Platen expects 30,000 visitors here annually. The Atlanta project is the company's biggest investment outside Germany. In addition to putting all of Porsche's U.S. operations in one place, it gives the brand a place to demonstrate the "smell, touch, feel" of Porsche vehicles, von Platen said. "The visitors who come here will experience a brand and our products in a way they have never done before," he said. 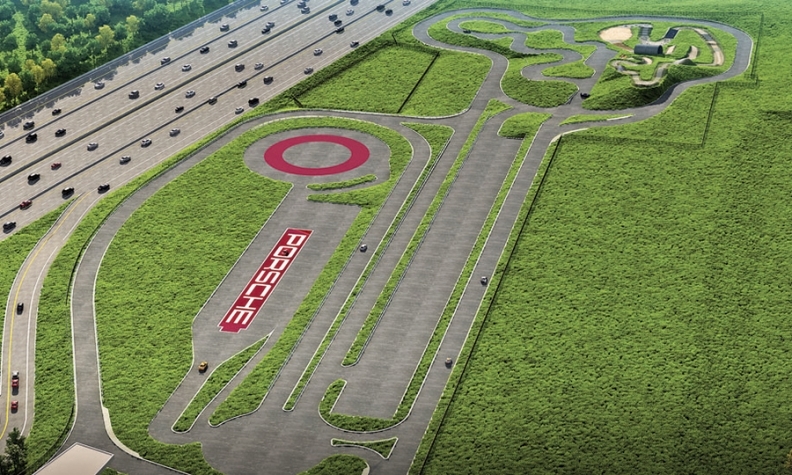 The center has a 1.6-mile test track and six driving modules, including a handling circuit, off-road course, low-friction circle and a kick plate that mimics sliding. Visitors will pay $300 to $750 for driving packages that will allow them, say, to compare the Porsche 911 GT3 with the 911 Turbo. Porsche also will design custom packages for visitors, who can book through dealers or online. Customers can bring their own vehicle to the track. They can even have a new vehicle delivered to the center for an additional fee. Employees began moving into the corporate offices in January. More than 400 will work at the site, which is south of Atlanta's downtown just a few minutes from Hartsfield-Jackson Atlanta International Airport, one of the world's busiest airports. That location will make it easier for customers from all over the country to get to the center, von Platen said. A 918 Spyder, Porsche's nearly $1 million supercar, was delivered on-site to a customer a week before the grand opening, he said. The airport proximity also suits the center's use for conferences and events. Beginning this month, Porsche has booked meetings for a variety of companies and other entities, including nonprofit organizations. They can rent meeting rooms or sections of the building, which houses a fine-dining restaurant, cafe, a museum of classic Porsches and a vehicle restoration center. Other features include driving simulators, a custom vehicle design studio and what Porsche calls a human performance center: a gym with specialty equipment to evaluate visitors' fitness levels and trainers to customize nutrition and fitness programs. Porsche will open a second U.S. customer experience center in mid-2016 near Los Angeles. The company also has tracks in England and Germany and is building one in China (see story, Page 34). Porsche approved the investment in 2010 when the company's U.S. sales were starting to recover from a recessionary plunge. Rebounding from that 2009 low of 19,696, the brand sold 47,007 new vehicles in the U.S. last year. The company should top 50,000 U.S. sales this year, von Platen said, three years earlier than Porsche's deadline for that target. 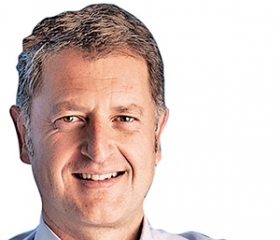 Von Platen and Porsche are betting the investment pays off with more loyalty from existing customers and new buyers who end up purchasing vehicles after a track experience. "We want to have an open space for the public," he said. "We really believe in the growth of this market."